When my first baby was born, I totally fell out of the habit of wearing necklaces. (I basically fell out of the habit of getting ready everyday!) I didn’t want my necklaces to break when he pulled on them, it hurt my neck if it was a skinny chain, and I didn’t want any pieces falling off and choking him. I realized I could make my own mom friendly necklaces, and I could make it comfortable for me and enjoyable for my baby. I love that I have something cute to wear, and that I always have a toy within reach for my baby. 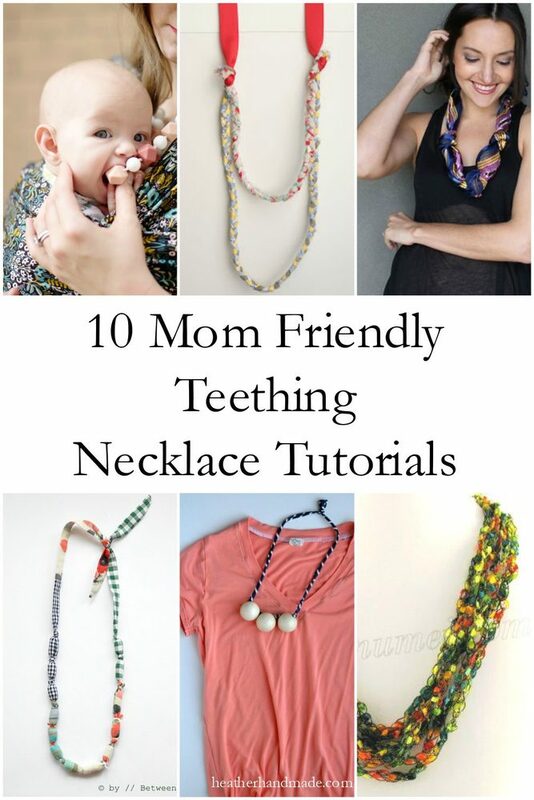 These are the ten best mom friendly teething necklace tutorials! Which is your favorite? 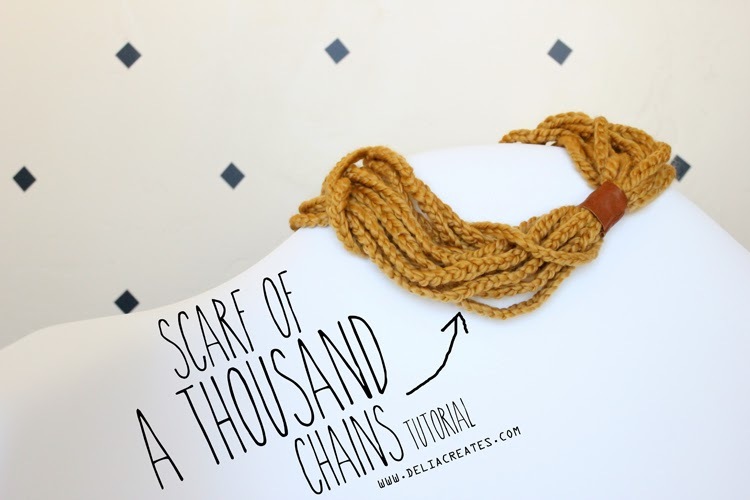 Scarf of a Thousand Chains Free Crochet Pattern – A really easy, basic crochet necklace that makes a big statement. 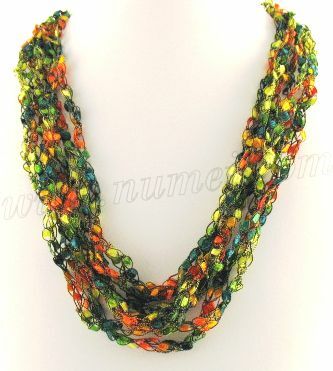 You could use some colorful yarn with variegated colors. I would recommend using cotton since wool will felt if slobbered on by a baby. 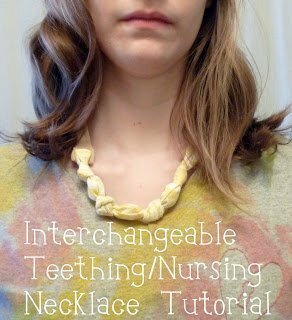 Interchangeable Teething Necklace Tutorial – I made this when I was nursing and still have them around for baby #2! I loved making one necklace that could change with my outfit instead of making multiple necklaces. I love using up scraps for this necklace! Crochet Adjustable Necklace Free Pattern: Pattern 1 – I made one of these and my SIL made me one, and it was my very favorite thing to wear with babies and toddlers. 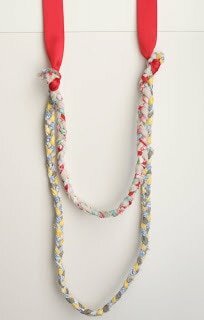 It’s soft, it looks like a big statement necklace, and it’s really easy to make. Just make sure you get yard that looks beaded! 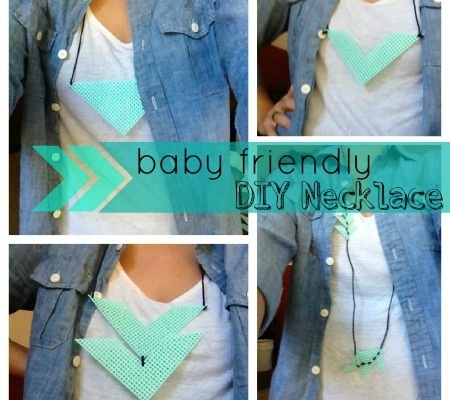 DIY Baby Friendly Necklace Tutorial – How cool is this necklace? It’s big and graphic, and you could do so much with different shapes! You could do some really interesting shapes, colors, and weaving. 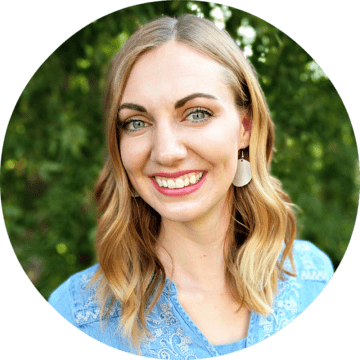 Statement Necklace: Tie Knots in a Scarf – You could do this ten minutes before you need to go somewhere and have an awesome necklace! It might get a little wet if baby is sucking on it. It would be best for younger babies who aren’t putting things in their mouths yet. Braided Fabric Necklace Tutorial – This necklace is unique and quick! You could really play with the colors and prints you use, and the two layers are great for occupying babies. This is also a great scrap buster! 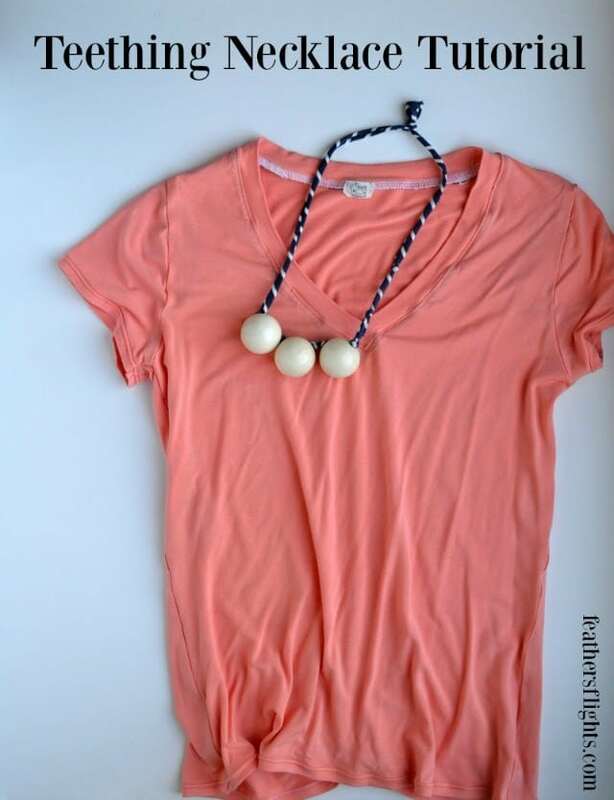 Wooden Bead Teething Necklace Tutorial – The tshirt fabric used in this necklace makes it comfortable, soft, and stretchy. 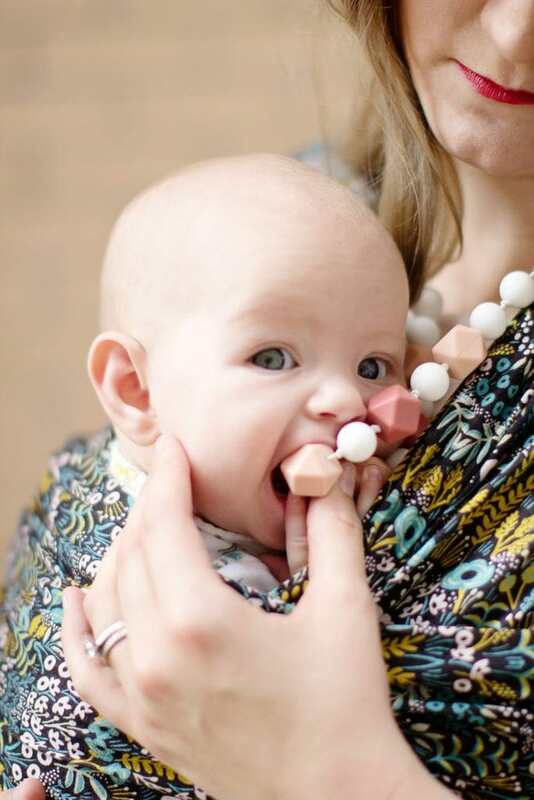 The beads are perfect for teething, and it’s a quick last-minute toy whenever you need it! 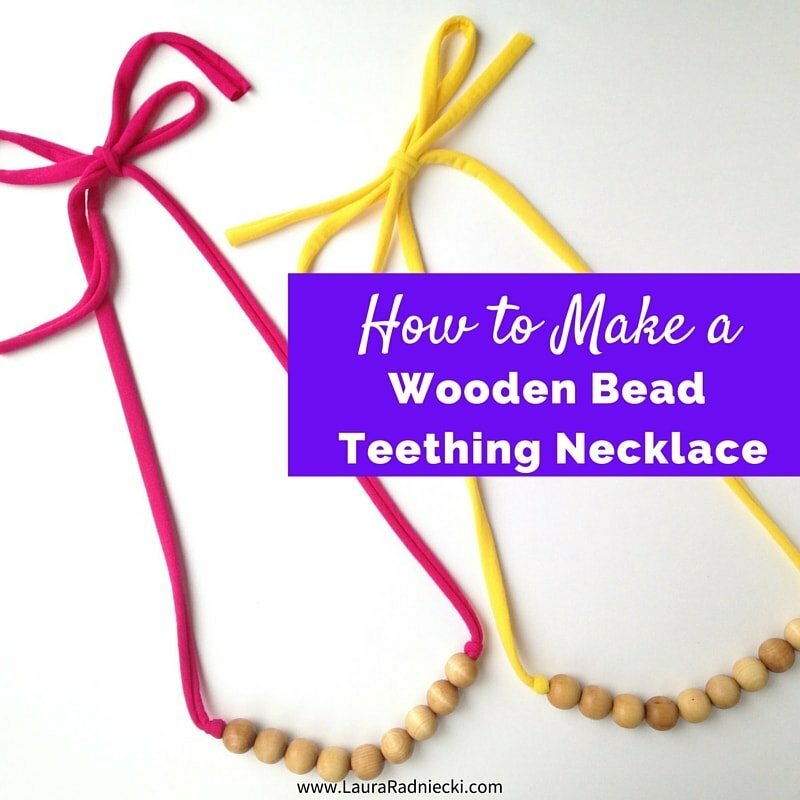 Wooden Bead Teething Necklace Tutorial – I love the look of wooden beads especially with the contrast of the bright colors. The bow in the back is really cute, and would be easy to tie again to lengthen or shorten the necklace. DIY Teething Necklace Tutorial – This one is so cute! I love the different shapes and colors of the beads. It really looks like a regular necklace, but it’s perfect for little baby hands and mouths. 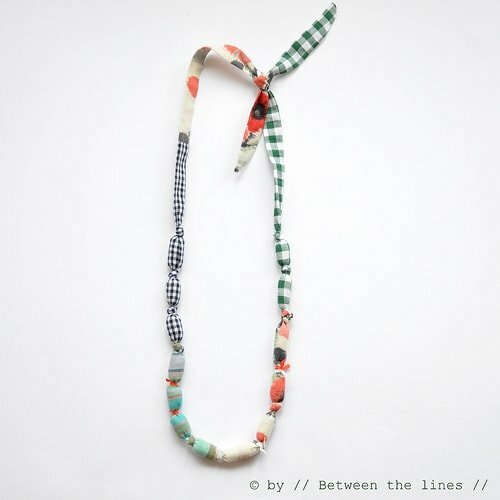 DIY Fabric and Bead Necklace Tutorial – The contrast of the fabric and colors of this necklace just make my heart sing. I love the bow, the knots, and the hidden beads. You can make some really fun looks with this tutorial! Awesome Necklace, though model gives it more shine.